Even though Hurricane Irene blew through on August 27th without flooding the subways, which were rendered prophylactically still and silent for a day, a pesky summer storm in 2007 dumped so much water onto the M and R lines that they were forced out of service. Governor Spitzer took immediate action to mitigate the problem, and boldly mobilized the Metropolitan Transportation Authority and the Department of Transportation to do something about it. Solving a range of engineering problems while at the same time providing a streetscape element with some wit and whimsy, Rogers Marvel Architects created banks of raised stainless steel grates that rise up into an undulating wave of slats and hammered speckled side walls. 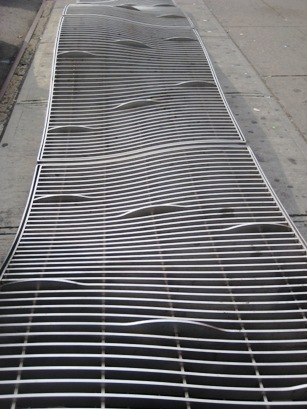 There are three typical grates designed for specific water overflow depths. 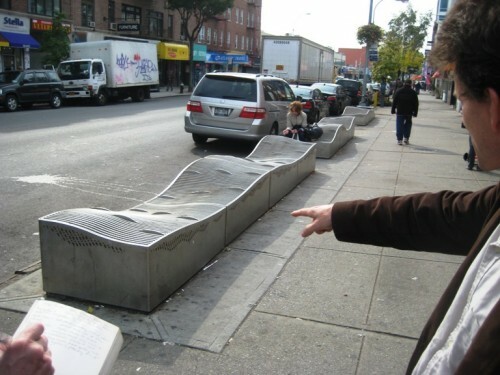 They can be combined in a left- or right-hand fashion to create the continuous surface over the structural grates below. In case you were wondering, they won’t stop a truck, but happily no Louboutin heels snapped off here! For the info on the tour of tomorrow’s Building of the Day click here: Alice Tully Hall, Lincoln Center.